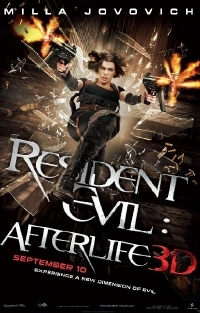 Second trailer for RESIDENT EVIL: AFTERLIFE brings more awesome! Ha! As if we needed another reason to get excited about it, a new trailer has appeared online for the upcoming Resident Evil 4 film aptly titled Resident Evil: Afterlife. If you havenâ€™t seen anything on this project yet, youâ€™ve definitely been missing out so be sure to catch our previous coverage here and here. Now youâ€™re ready to take in the new trailer which takes us to Alaska, back to Raccoon City and then underground in search of the ever elusive Umbrella Corporation. Via the good folks at Buy Zombie. Why block a trailer? isnt the whole idea to get it out there? What is this mini disc of which you speak? does it offer superior play back to my BETA system? Damnit, I still want data cube crystals. Big evil corporations for the win!